New Year's Resolution: More Challenge Please! People might argue, "The increased rigor of today's classroom is ruining our children! Let them be kids! Enough with the crazy standards and unreasonable expectations!" And I agree--enough with UNREASONABLE expectations. That being said, I have been doing this teaching thing for quite some time, and I have noticed a number of things. One of them is that as our standards have increased in rigor, many students do not have the learning behaviors to tackle them. It's not that they don't have the ACADEMIC ability--they simply don't have the proper "learning behaviors" to be successful. This can happen for a number of reasons. They haven't had to tackle challenging tasks before. They have gotten too much help (you've seen it--the learned helplessness? ), They might not have someone who truly can help them believe that they CAN do it. That's where YOU come in. 1. Be your students' number one cheerleader. I know it seems simple--but when students know that we really believe in them, it's contagious. Some of our students have very few people in their lives who can serve in this role--and we can do it. That whole "unconditional love" thing? It's "unconditional belief". No matter what. 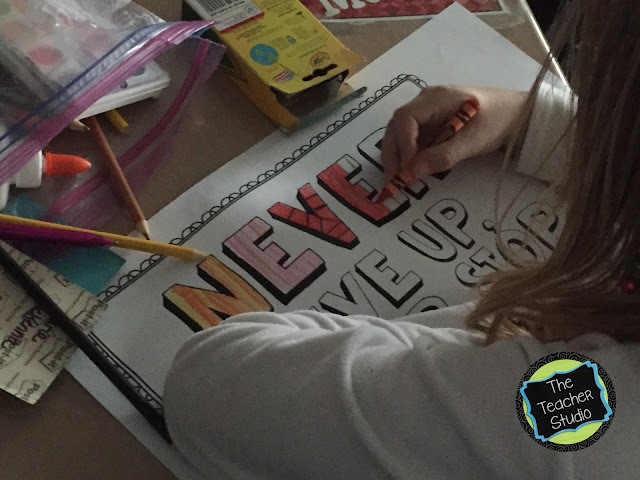 My trickiest kiddos are the ones I need to convince of this the most--that no matter what they do, I still believe in them. In order to learn, they need to feel connected to their school--and we are the gatekeeper to this. I LOVE to tell my students things like, "I have SUCH a hard problem for you to try today...and I KNOW you are going to have a hard time--but I am confident you will be able to at least get started..." Establishing that climate where challenge is expected and acknowledged with a positive attitude (not "This is really hard because our state standards are ridiculous and I don't even know WHY they think this is appropriate for you guys.") This cheerleading can extend beyond the classroom too...ask about their basketball games. Know about their piano recitals. Talk about what book they are reading. Show them you care and that you believe in them. With the rush of our schedules, it's easy to focus our energy on our "to do" list. I "resolve" to focus more energy on my students than the work I am asking them to do--I guess you could say my resolution is to be more "present" with my students this year. The curriculum will still get taught. I promise--and believe it or not, students who feel loved and cared for at school are far more willing to take risks, work hard, and be engaged in our challenging curriculum. 2. Put them in situations where they will fail. And be there to pick them up and show them how to recover. I know it is, for most of us, in our nature to minimize discomfort in those around us-especially children! That being said, there is something to be said about helping students learn to struggle. In fact, recent brain research is VERY compelling that allowing students to struggle actually develops their brain. Check out this two minute video by Jo Boaler as she explains a little bit about this. The research is there--we need to put students in situations where they must tackle challenging tasks--and they need to make mistakes...and they need us to explain to them why mistakes are valued! Nothing makes me happier than when one of my students makes a mistake and shares about it with the class so we can all learn from it...we have the power to build this culture in our classrooms in 2016! 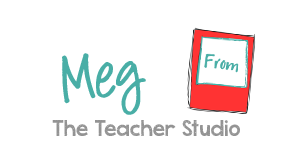 Want a problem to use with your class to help them struggle a bit? Grab this freebie and try it! 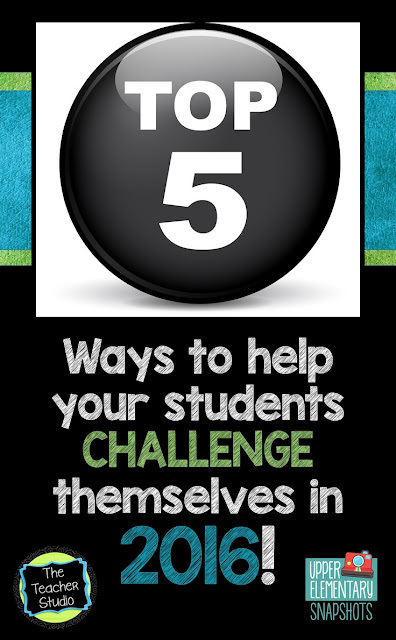 If you like it, I have a zillion other problem solving tasks and open ended challenges in my store if you want to build more of these into your classroom instruction. 3. Teach them the language of asking for help--the right KIND of help! Another thing we, as teachers, can do this year is wait to give help just a little longer! Learning to ask good questions that get students "unstuck" so they can do it themselves is so important. Also, helping students learn to politely ask for help from other students is so important--as is teaching students how to "coach" without giving away answers. We've all seen students "help" by simply telling the answer or doing the work--we need to scaffold this so students can learn how to ask those same questions to gently encourage. "What would happen if you drew a picture?" "Try rereading the first paragraph and see what it tells you." "What do you know about adding fractions?" All of these are "hints" that can be just enough to allow a child to tackle something challenging without DOING the "thinking work" for them. Yeah...I'm guilty of this sometimes. I need to remember to slow down so this can happen. 4. Model your own "grit" and growth mindset. 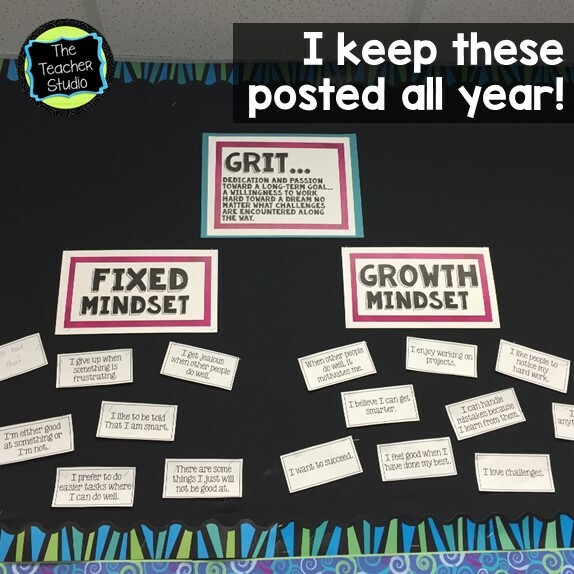 If you have followed me for a while, you know that I really strongly believe in teaching a growth mindset in my classroom. I wrote about it HERE if you are interested in reading more. As this year has unfolded, I have really tried to model times in m own life when I have had to face challenges--and I don't mean climbing Mount Everest! I talked to my students about the difficult decision I faced when buying a new car and the steps I took. I talked to them about my son's struggle to pick a college and what he did about it. I even share my frustration with a technology issue we continue to have a school. What I want them to see is that challenges and problems abound--but we all have strategies we can learn to handle them! 5. Help your students understand the PURPOSE of what they are doing--help them make connections and see why you teach what you teach. As simple as this sounds, I think we sometimes get so caught up in our units and learning targets and standards and assessments and schedules that we simply forget to "fill in" our students about WHY is is that we do what we do. Explaining that learning how to combine sentences is important because writing a variety of different sentence types makes your writing flow better for the reader. Explaining that it is important to learn math facts fluently because it will help free their brain up to focus on the more complex math that is coming soon. Explaining that reading a variety of different genres actually helps their brain learn to read and understand different organization structures. You'll know you are starting to head in the right direction when your students start asking--"Why is this important to learn? "...and hopefully you can answer! 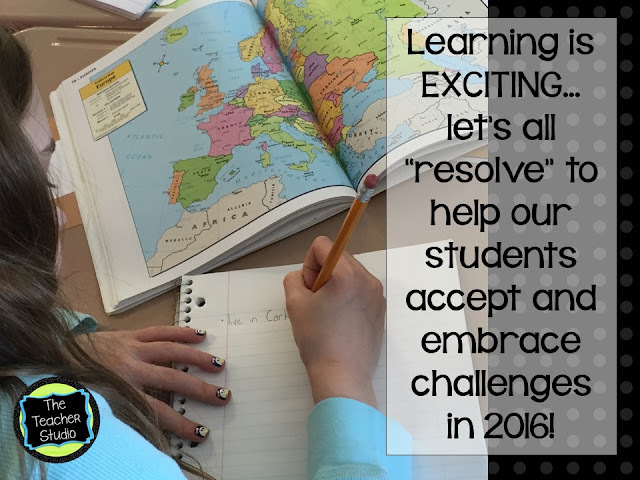 Thanks for stopping by...as your 2015 comes to an end, our wish for you is that 2016 is your best year yet--and we can't wait to keep sharing our teaching tips, ideas, and resources with you.